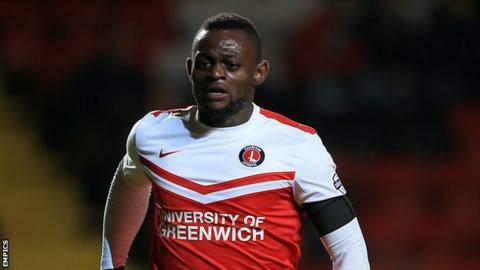 Charlton ended a 13-game winless league run and gave manager Guy Luzon his first victory with a deserved success against play-off chasing Brentford. The Addicks - without a win since November - took a first-half lead when Johann Berg Gudmundsson hit a left-footed shot into the top corner. The home side went 2-0 up when Igor Vetokele steered his 10th goal of the season into the bottom corner. Frederic Bulot then seized on Harlee Dean's mistake to add a late third. Much of the build-up to the match had centred on the future of Brentford manager Mark Warburton and his side were well beaten as their impressive run of three straight away wins came to an end. The hosts began the game three points above the relegation places but started brightly and Bees goalkeeper David Button had to be alert to deny Gudmundsson an early goal. The work-rate of Charlton's strikers continued to cause problems and Button was forced into another save from Tony Watt's deflected attempt. But their pressure told midway through the first period when Vetokele teed up Gudmundsson, who finished superbly. Charlton had not won a home game since 21 October - a run of nine games, while Brentford had won their last three Championship away games. Charlton doubled their lead 10 minutes after half-time when Watt dragged defenders towards him and set up Vetokele to finish well. Alex Pritchard had the best chances for Brentford but his free-kick and snap-shot were both comfortably saved by Stephen Henderson. A resounding win was completed late on when Dean allowed Bulot a free run on goal and he struck a left-footed shot into the corner to give Luzon, who replaced Bob Peeters as manager in January, his first three points. The result moves Charlton six points clear of the relegation places, while Brentford slipped out of the top six. "From the start we created chances. We scored three and were very organised. "We deserved to win but it was not easy after three months without a win working on the mental side. "It is the first step. Our goal is to go to the next game and show the same performance as that is the only way." "That today was not Brentford; we were slow to the ball, we made poor decisions, we were sloppy in possession and quite simply we were not good enough. All credit to Charlton. "It's too easy to say matters off the pitch had an impact today, but absolutely not. "This group is better than that. There is too much quality in the group and as staff we would not allow it. "I'm sure there will be another statement out this week to provide more clarity on my future." Match ends, Charlton Athletic 3, Brentford 0. Second Half ends, Charlton Athletic 3, Brentford 0. Attempt blocked. Tommy Smith (Brentford) right footed shot from the left side of the box is blocked. Assisted by Jonathan Douglas. Goal! Charlton Athletic 3, Brentford 0. Frédéric Bulot (Charlton Athletic) left footed shot from the left side of the box to the bottom right corner. Assisted by Stephen Henderson. Corner, Brentford. Conceded by Chris Solly. Tony Watt (Charlton Athletic) wins a free kick on the right wing. Attempt missed. Harlee Dean (Brentford) right footed shot from outside the box is too high. Attempt missed. Jon-Miquel Toral (Brentford) left footed shot from the centre of the box is too high following a corner. Corner, Brentford. Conceded by Stephen Henderson. Attempt saved. Alex Pritchard (Brentford) right footed shot from outside the box is saved in the bottom left corner. Corner, Brentford. Conceded by Morgan Fox. Substitution, Charlton Athletic. Lawrie Wilson replaces Igor Vetokele. Attempt blocked. Alex Pritchard (Brentford) right footed shot from the left side of the box is blocked. Assisted by Jon-Miquel Toral. Attempt saved. Alex Pritchard (Brentford) right footed shot from outside the box is saved in the top centre of the goal. Roger Johnson (Charlton Athletic) is shown the yellow card for a bad foul. Attempt blocked. Nico Yennaris (Brentford) right footed shot from outside the box is blocked. Attempt blocked. Andre Gray (Brentford) left footed shot from the centre of the box is blocked. Assisted by Jon-Miquel Toral. Tommy Smith (Brentford) wins a free kick in the defensive half. Foul by Chris Long (Brentford). Attempt saved. Alex Pritchard (Brentford) right footed shot from outside the box is saved in the bottom left corner. Assisted by Jonathan Douglas. Attempt saved. Jonathan Douglas (Brentford) right footed shot from outside the box is saved in the bottom left corner. Assisted by Alex Pritchard. Hand ball by Alex Pritchard (Brentford).